Ok. So I have this Bookshelf in our bedroom that unfortunately has become the storehouse for any and everything. With our lack of furniture I thought for sure this bookshelf would come in handy to keep things organized but boy was I wrong! Now, keep in mind this isn’t the final product but I’m just too eager to wait until I’m completely finished this project to share 😉. My grandfather built this bookshelf and I have no clue how old it is but it needs some love. Once the weather warms up I plan on hauling this baby outside in the back yard to get a fresh coat of white paint or a new stain. 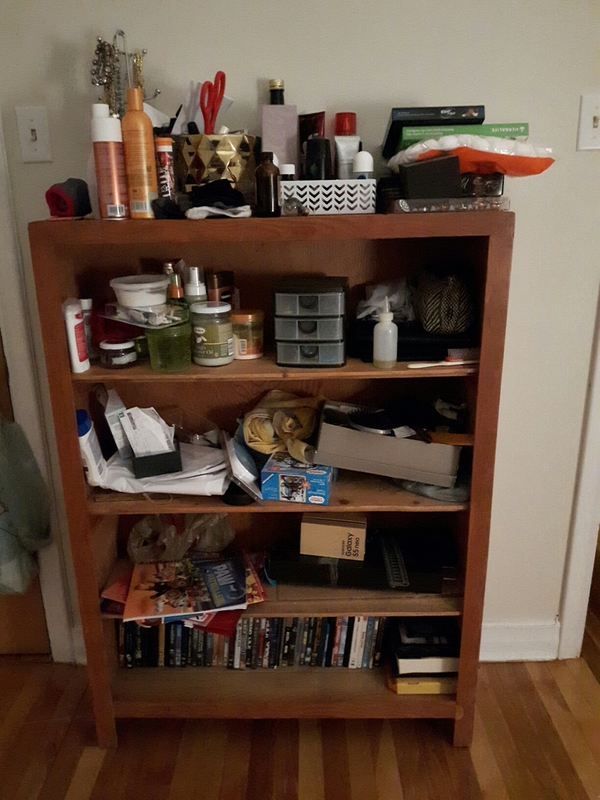 On the top of the bookshelf you’ll see on the left I have a jewelery stand which thankfully I already owned. I want to buy or make a prettier stand but for now it does the job. In the middle I bought this white organizer from Homesense with 9 compartments. Now I have no idea why but this thing was on clearance for $7. Nothing is wrong with it at all and all the others were marked at $12 so I lucked out with that! Right now it’s storing the toiletries that my husband and I use on a daily basis. Cute and neat! And then on the right I bought this desk accessory from the dollar store for $3. It’s meant to hold files, letters, documents, pens etc. But I thought it’d be perfect for holding my makeup palettes ands brushes. So far it’s working great! The only thing that bothers me is the silver so I’m thinking I should paint it gold to match everything else. On the first shelf I have this grey storage bin from the dollar store for another 3 bucks! It’s currently housing all the hair products and toiletries that we don’t use on a daily basis. It’s a fabric bin with a chalkboard face on the front but I didn’t feel like showing the chalkboard so I simply turned them around 😊. Now some may call this ghetto but I call it creative… but the clear trays on the side on the grey bin is actually an old Ferrero Rocher chocolate box. I got the chocolates for free so why throw out a good box? I kept the plastic insert that is originally meant to hold the chocolates in place as I thought it would be the perfect thing to store my small earrings! See? 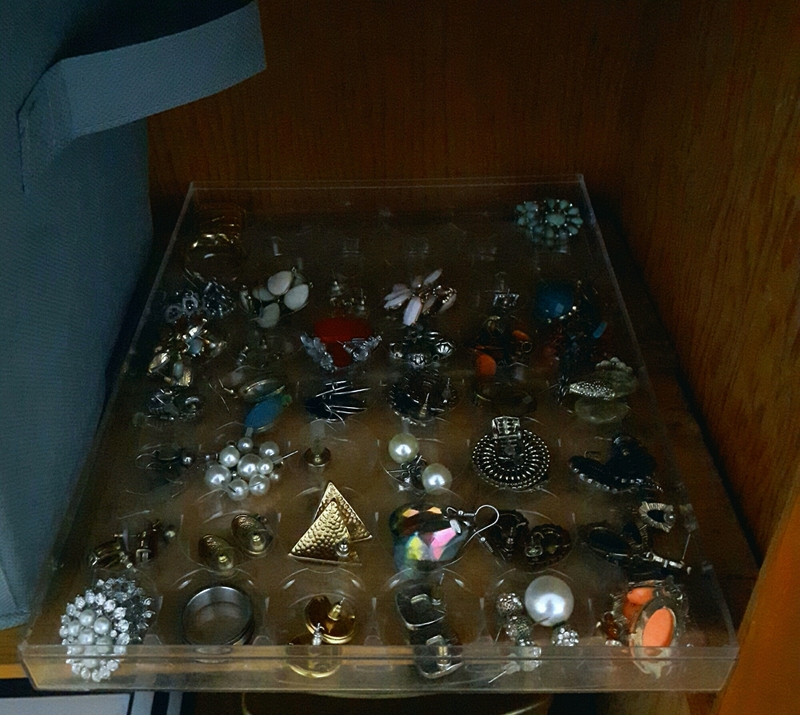 The picture isn’t so clear but they’re all separated and in order which makes it so easy to find my earrings when I need em’. The top lid of the chocolate box is on the left side and is now just holding random knickknacks but I need to fix it up better. Any ideas? Can I just say I love gold??? Even before it was trendy to have gold accessories I just think gold is such a glamorous touch to a room or outfit! So here you’ll see on the left I have an old vase from a flower arrangement that was sent to my office about a year ago. Once those flowers died I grabbed that vase and asked my boss if I could take it home to which he replied sure no problem. All I could think was “score!! !” Free vase AND it’s gold! Right now it’s being used to store my nail polishes. Not ideal because I literally have to go digging deep into this thing to find a specific bottle which results in dumping the entire contents out but for now it does the job. In the middle I found this cute cardboard storage box from Homesense on clearance for $7 because there was a small tear on the flap which is no big deal at all! I’m using it to store my hair tools. It’s navy and white with gold dots and it says “throw kindness around like confetti” cute right? To the right is a little storage container that a bought from the dollar store a few years ago for 2 bucks I think. It holds my larger earrings and whatever I can’t hang on the jewelry stand on top. You’ll see in the first picture this thing is actually black but I thought it stuck out like a sore thumb so I grabbed my gold paint and paintbrushes that I already had on hand and I added a few coats to the exteriors and the little handles. Did I just make myself a gold jewelry box for free? Yes, yes I did! 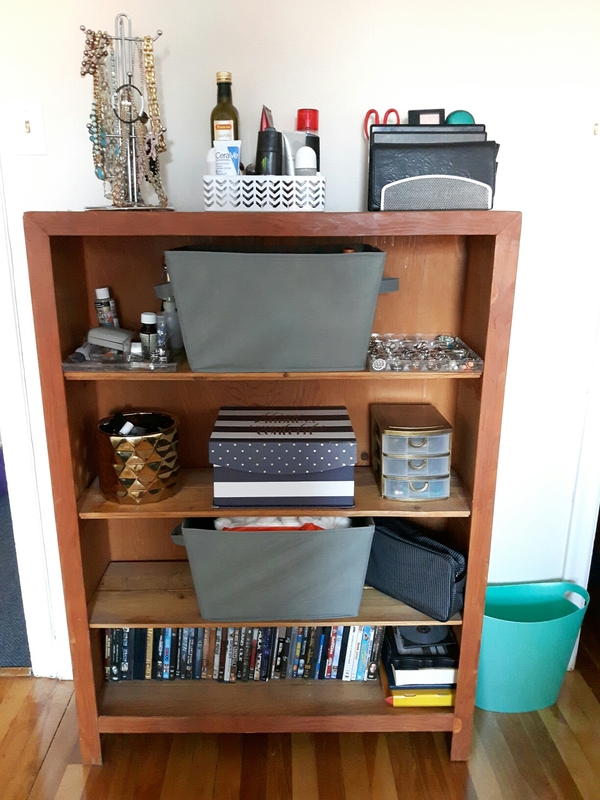 On the bottom 2 shelves I have another grey bin from the dollar store that is housing books, documents and other random items and my makeup bag. The bag isn’t cute at all but again, it does the job as my last one was bursting at the seams. 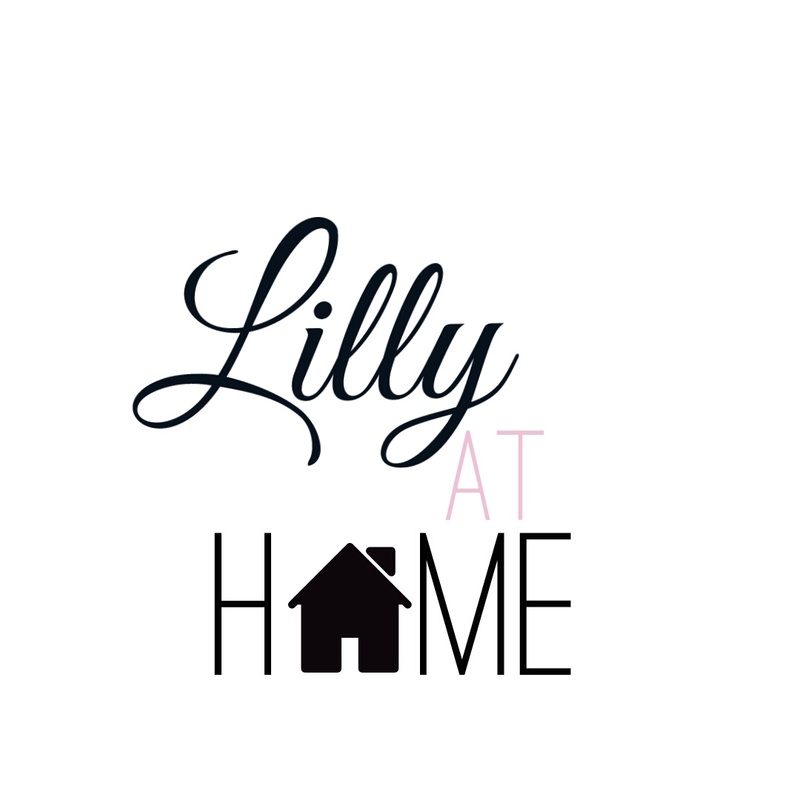 Eventually I want to buy a cute makeup box that will match everything else on the shelf while also being functional and organized… hmmm maybe I can make my own makeup box (do I hear a future diy coming up?) 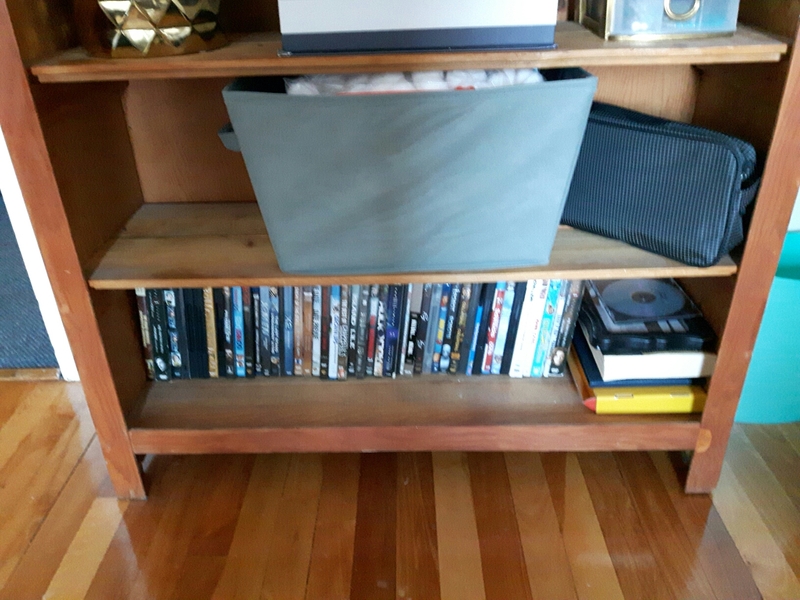 And then of course the DVD collection at the bottom is my next task to hide away neatly. Why are there dvds in my bedroom you might ask? We don’t have a functional TV Stand in the living room yet so they will be stored here for the time being. That probably means I should not even bother trying to organize them since I know it’s only temporary… ah well, we’ll see what happens! So that’s it! 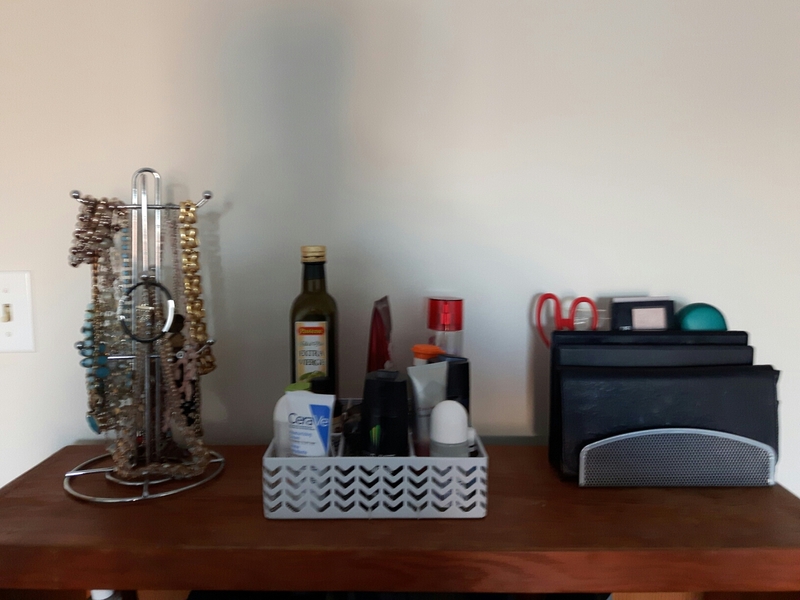 It’s not much but with a few bucks, $23 to be exact, I’ve managed to clean up a pretty messy shelf! I’m kinda patting myself on the back right now and plan to keep this up!